Plaga hails from Poland, though one would never know it just by listening to them. These guys play a modern style of Black Metal that is very derivative of Swedish bands of the past decade or so. After a lackluster demo and mediocre mini-album, they went back and refined their sound a bit. Released in April 2013, Magia gwiezdnej entropii has gotten a fair amount of attention from younger listeners. While they have made some improvements, this leaves a lot to be desired. Musically, Plaga has nothing to do with those Polish bands that preceded them, such as Graveland, Infernum or Veles. The songwriting here is immensely influenced by modern Swedish Black Metal acts, primarily Watain and Ondskapt. This is undeniably obvious from the first moments of the album. Nearly everything, from the shouted vocals to the melodic guitar riffs, has been plagiarized from their northern neighbors. Even the lyrics offer nothing more than another rehashing of the same faux-evil Orthodox themes of the aforementioned bands. The production shares the clarity of Dödens Evangelium, not sounding so slick and polished but still possessing an overall loudness and claustrophobic mix that boldly marks it as modern. With all that said, there are some decent riffs on Magia gwiezdnej entropii. The best moments are when they go forth at a fast tempo, unleashing cold tremolo melodies that would not be out of place on Casus Luciferi. However, any momentum that they build is quickly lost. "Slaying the Spiritless Abel" features a lot of melodic riffing and stripped down drumming, somewhat reminiscent of Merrimack's Of Entropy and Life Denial, which clearly shared the same inspirations. One strange thing about the songwriting, and quite likely the main reason that this band appeals to so many people, is the simplistic playing. Though they utilize these tremolo riffs, the overall rhythm and the drumming of songs like "Trąby zagłady cz. II" and "Śmierć cieplna wszechświata" is often more rock-based and catchy, which is a detriment to the purity of the material. Surely, it is much more easy to digest and will attract more listeners, but the atmosphere is considerably less dark when such elements are involved. And though even Burzum resorted to similar rhythms, Darkthrone's Transilvanian Hunger later showed that the most bleak and pitch-black feeling was to be achieved when Black Metal fully transcended its Heavy Metal and even the earlier Rock and Roll roots, embracing total minimalism and falling into the dark abyss created by the cold and grim guitar melodies. Magia gwiezdnej entropii possesses the aesthetics of something far more underground and necro, so it may come as a disappointment to some when they find so much melodic and catchy songwriting instead. This record offers moments where they hint at something a little darker, but they fail to ever delve to the necessary depths to produce this. 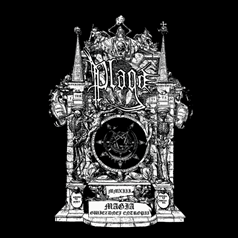 Like Mgła, Plaga's material will surely be enjoyable to those with less demanding taste, but this modern breed of Black Metal pales in comparison with those that came before. Give a listen to the new Clandestine Blaze to hear someone doing it right.